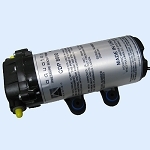 These pumps are designed for intermittent duty, although most models can run continuously for hours at a time. 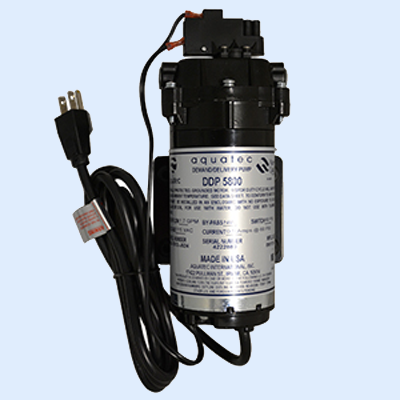 They are typically used to either pressurize water drawn from an atmospheric tank, deliver purified water to a specific point of use, or merely to increase pressure when required. These pumps can either be controlled by pressure switch ("demand" mode) or an external power control device ("delivery" mode). When necessary, they can incorporate an integrated bypass to help limit pressure. 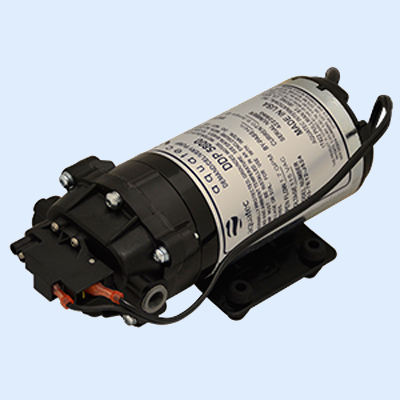 Motor: Available motors from 12v DC to 230v AC, energy requirements between 25W-100W (depending on flow, pressure). Can be used with compatible transformers and/or DC power supplies. Standard terminations are 12", stripped end AWG lead wires, with connectors and power cords also available. Envelope Dimensions: Approximately 75mm x 100mm x 175mm, weighing 2.7 Kg. Mounting: Standard offering is a steel mounting base with four hollow rubber grommets. These pumps may be mounted in any position. Control Options: Internal bypass (20-200 PSI), pressure switch (40-100 PSI). Fittings: 5800 Series options include built-in 3/8", 1/4", or 5/16" John Guest half cartridges. 7800 Series options include 3/8" or 1/2" hose barb, quick connect fittings. Pump design: 3 chamber diaphragm pump, self priming, capable of being run dry. Performance measured with flooded inlet (0 PSI), 70° (21°C) ambient water temperature and voltage controlled at 230v AC, 60 Hz. Positive inlet pressure will increase the discharge pressure by a similar amount for a given flow.